Public resentment continues to seethe over widespread grievances of injustice and unfairness, while social unrest continues to escalate across the country. After suffering decades of state oppression and violence, many Chinese no longer trust the communist regime and are desperate for justice. As of June 28, 140 million Chinese have renounced all association with the Chinese Communist Party and its affiliated organizations, according to the Epoch Times’ Tuidang website (‘Tuidang’ in Chinese means ‘quit the Party’). There was a further surge of renunciations on July 1, the ruling Party’s anniversary, with many Chinese choosing the specific date to sever their ties with the world’s largest communist organization. There is an ancient Chinese saying that “food is as the heavens to the people,” meaning that food is of the foremost importance to a country’s citizens. However, this basic sensibility has been completely disregarded by the authorities in China today, with food safety becoming a very real problem for most Chinese citizens. Food contamination scandals have become almost commonplace, including recurring milk powder scandals, mercury-tainted medicine pills, and the discovery earlier this year that almost half the rice in one southern Chinese city contained dangerous levels of cadmium, following an earlier report that nearly 10 percent of all rice in China could be contaminated with the poisonous heavy metal. Food safety concerns first arose among the Chinese public when fake milk powder killed at least 12 babies in the city of Fuyang, Anhui Province in 2004. In 2008 the public learned that Chinese firms had been intentionally adding the industrial plastic melamine to milk products, and many Chinese lost their confidence in domestically produced food products, particularly milk powder. Many Chinese now flock overseas to buy vast quantities of milk powder, to the extent that supermarkets in some countries now enforce limits on the amount of milk powder each shopper can purchase at a time. On June 30, it was discovered that rice from the Xiangtan area of Hunan Province had been tainted with heavy metals that had polluted the farmlands there. Panic ensued in Changsha, the capital city of Hunan, and in the neighboring Guangdong Province. Local rice farmers were subsequently unable to sell off their harvests of premium-quality rice even at steeply discounted prices, resulting in heavy losses for them. High-ranking Party officials often obtain their food from special suppliers, or their own private farms, ensuring the safety of their own food and effectively divorcing themselves from the issue of food safety for ordinary Chinese citizens. Facing the growing problems of corruption, social injustices, environmental degradation, and a widening wealth gap, many Chinese have not only started voicing their unhappiness on these issues over online forums, but also through mass demonstrations and protests throughout the country. Social unrest in China has risen dramatically over the past two decades. According to a report by the Europe China Research and Advice Network (ECRAN), there were few recorded incidents of public demonstrations, disruptive action or riots in the 1980s. But between 1997 and 2005, the number of mass protests grew by ten times from 8,700 to 87,000. It is further estimated that between 180,000 and 230,000 public protests that took place in 2010. On June 27, traffic police in the city of Chengdu in Sichuan Province forcibly intercepted a slag transport vehicle on a road, causing it to collide into a large truck in front of it and killing its driver. The tragedy sparked a large protest involving hundreds of slag transport drivers and thousands of bystanders. The local authorities dispatched a force of 1000 armed officers to quash the protests, and in the ensuing clash, multiple police vehicles were overturned and smashed, and dozens of people were left injured. In another instance, on June 24, nearly 1,000 villagers blockaded the entrance to the local government office in a town in Hebei Province, to protest the lease extension on a piece of land that township officials had approved without first obtaining the approval of the village’s council. In response, local authorities mobilized over 20 police vehicles and 200 policemen to face the protestors, which resulted in a traffic jam that lasted for more than 10 hours. In May, three mass protests were held in the provinces of Sichuan and Yunnan against planned chemical plants that would produce the carcinogenic chemical paraxylene, and likely contaminate the surrounding environment. Similar demonstrations over environmental issues have also taken place this year in many major cities, including Beijing, Shanghai, Chengdu, and Shenzhen. According to a report published by Human Rights Watch this year, official and scholarly statistics estimate that between 250 to 500 protests take place in China every day, with participant numbers ranging between tens to tens of thousands. The rampant corruption present throughout China’s government apparatus is fully recognized and well documented by professional journalists and academics alike. In the paper by prominent Chinese writer and economist He Qinglian titled “On Systemic Corruption in China and its Influence,” she wrote that, beginning in 1998, corruption in China was characterized by an organized pattern of behavior, which later transformed into systemic corruption. According to He, former Chinese regime head Jiang Zemin’s 2001 “July 1″ speech, introducing “the entry of private entrepreneurs into the Party,” effectively opened up an institutionalized route for the integration of China’s political and economic elites, allowing them and their families to cooperate for mutual benefit at the expense of the people. The corruption scandals of Jiang and his son are such examples. Jiang was the Party head of the Chinese Communist Party from 1989 to 2002, and this gave him the ability to abuse his political power and embezzle government resources for personal gain. His son, Jiang Mianheng, was also recently implicated in several corruption scandals that took place during Jiang’s term in office. In 1994, Jiang Mianheng used just several million yuan to purchase the state enterprise Shanghai Joint Venture, which was worth several hundred million yuan on the Shanghai Stock Exchange at that time. Through the illegal privatization of state assets, many state enterprises, including China Netcom, Shanghai Automobile Industry, Shanghai Information Network, and Shanghai Airport Corporation, eventually became the private properties of the Jiang family, although they remained state enterprises in name. Former Vice President Zeng Qinghong, also known as Jiang’s “right-hand man,” was another such example of corruption among China’s ruling elite. Exposed by The Epoch Times and other sources, Zeng and his family, with the help of a Taiwanese businessman, set up enterprises such as China Eastern Airlines, as well as the Closer Economic Partnership Arrangement (CEPA), which allowed both Zeng’s and Jiang’s families to carry out money laundering and secretly transfer funds out of the country. In May 2006, 91.6 percent of the shares in the state-owned utilities company Luneng, which was valued at 73.8 billion yuan (worth US$9.47 billion at that time), were secretly transferred to two little-known Beijing-based private companies for 3.73 billion yuan ($478 million), China’s finance and economics magazine Caijing reported. An estimated US$7 billion in state-owned assets were lost to the state in the deal. The magazine Foreign Policy named the most sensitive person involved in the deal as Zeng’s son Zeng Wei. The Zeng family then transferred most of the money acquired from the deal abroad. A total of US$3.79 trillion in illicit funds flowed out of China between 2000 and 2011, according to a 2012 report by Global Financial Integrity (GFI), a Washington, D.C.-based anti-graft watchdog group. The illicit outflows grew from US$172.6 billion in 2000 to US$602.9 billion in 2011, which implied an average annual growth of 7.2 percent, only slightly below the 10.2 percent average annual growth rate of China’s GDP. The Epoch Times published the “Nine Commentaries on the Communist Party” in 2004, an editorial series that explores the nature and history of the Chinese Communist Party (CCP). The book has rapidly spread throughout China and the world, sparking the movement to renounce the Party. After decades of propaganda and censorship, growing numbers of Chinese have come to understand the truth behind the CCP, and renounced their connections to it and its affiliated youth organizations. Many Chinese chose the symbolic date of July 1, the 92nd anniversary of the founding of the Party, to announce their withdrawals from the Party. Li Lianpao, a delegate of the National People’s Congress, publicly declared his withdrawal from the CCP on his Sina Weibo account on the eve of July 1. Sixty-one-year-old Pan Renqiang, former judge of the Wuhan City Intermediate People’s Court, also denounced the CCP with his real name. In his withdrawal statement, he said he has seen through the CCP’s deceptive nature from decades of his own life experience. In mid-June, around 5,000 film projector operators from various villages and towns in Hunan jointly denounced the CCP in public. On April 15, People’s Forum, a message board service on the website of the Party’s mouthpiece People’s Daily, published the results of what it called a “confidence, belief, and faith” survey in the CCP’s ability to sustain its political and economic reforms. Of the roughly 3,000 people who took the poll, 80 percent did not agree overall, and another 10 percent said they were unsure. The overwhelming number of negative responses led to the survey’s removal from the website that same day. For decades, the Chinese Communist regime has never dealt with Chinese citizens through the right communication channels, but has instead continuously resorted to state-sanctioned violence that is fundamentally incompatible with any civilized society. 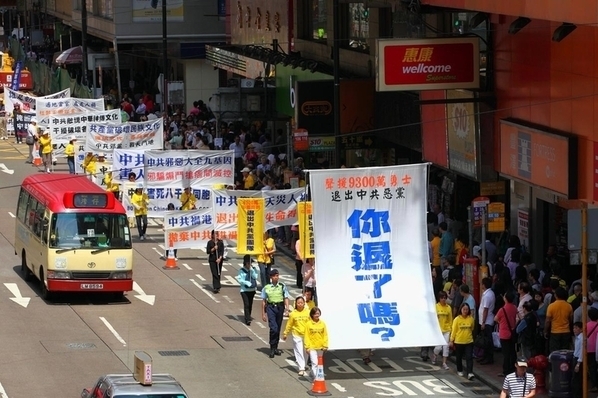 Many who have withdrawn from the CCP have denounced it as an evil organisation. In another interview with Sound of Hope, a Beijing resident surnamed Xiao said he declared his withdrawal from the CCP on the Epoch Times’ Tuidang website. “With more and more Chinese overcoming their inner fears of the CCP, this totalitarian regime will fall apart on its own one day,” he said. Translated by Euly Luo and John Wang. Written in English by Tan Shuyan.